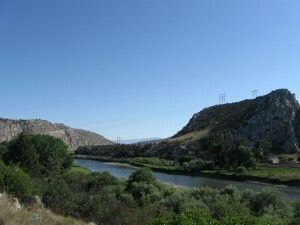 On July 25, 1805, The Corps of Discover, led by Captains Lewis and Clark, came across the headwaters of the Missouri River, where three other rivers, which they named the Jefferson, the Madison and the Gallatin come together to set the Missouri out on its 2,540 mile journey to the Mississippi River. 204 years later, to the day, I stood at the headwaters of the Missouri River. Cool, no? It was a two day ride from Great Falls down to Three Forks. 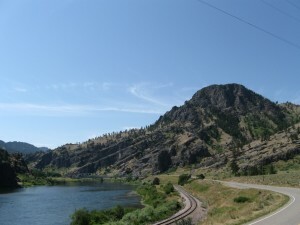 Between Great Falls and Helena was some amazing scenery along the river. It was a hot couple of days of riding there, and I got trapped in a couple small storms. I also popped my first flat tire of the trip. Just before Three Forks, though, I did get to stop in at this cool place called Wheat Montana Farms Bakery & Deli. These guys have a great story. The Folkvord Family started farming wheat out here, but after a while of it, they were troubled by the vagaries of selling their wheat on the whole market, so they decided to go one step further and bake their wheat into finished product. They now have a very awesome deli and bakery right off of I-90 near Three Forks. I stopped in for a sandwich and to hide from the rain for a little while. After exploring the headwaters near Three Forks, I took a detour off route from Lewis & Clark Trail to make my way down to Yellowstone. For the most part, I was following along the Madison River into the town of West Yellowstone, where I am today, before I set off into the park for a few days. I’m probably going to take a bit of a break from cycling and do some backpacking around Yellowstone. I’ll have to start keeping two mileage counts this trip: cycled miles and hiked miles. There’s been some tough riding around western Montana, and I know it’s only going to get harder as I go over the mountains, but the beauty continues to amaze and makes the experience what it is. I’ve adapted more, I think, to the inherent solitude of bicycle touring — perhaps the amazing things I’m getting to see have helped. I’m looking forward to the change of pace backpacking will bring for a few days. I’ve made friends with a tour guide from Yellowstone here who is going to tell me which spots are awesome to go to and which spots to avoid. Already, he’s shown me hidden, tucked away, secret hot springs to soak in. But I’ll tell you more about it on the flip side of Yellowstone. The mountains are coming! The mountains are coming! DUCK AND COVER! So I’ve made it to Great Falls, MT. I think that puts me at about 1,650 miles of cycling. Not really having any idea what my final mileage count is going to be on this trip (who knows what detours will distract me), I’ve decided to call this the half-way point. Were I to shoot straight for the coast from here, I’d be well over half done, but I’m expecting my path through western Montana to resemble a drunkard’s walk. There’s just too much cool stuff I want to check out while I’m in the area. From Winnett, I kept on rolling down SR 200, up and over the Judith Mountains and into Lewistown (which is, incidentally, not named after Capt. Lewis of the famed expidition, but another military officer, from a later period of history, who established Fort Lewis there. Lewistown also claims to be the geographic center of Montana). From Lewistown, I deviated from SR 200 to make my way up to Fort Benton. It was on this road that I took my first dive of the trip. 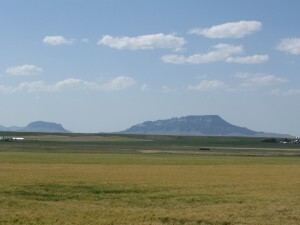 Riding down this 8% grade into a valley by Square Butte (every cyclist’s dream), and while distracted by the amazing scenary of the valley unfolding before me, the pavement ran out underneath me and suddenly I was hitting gravel road at thiry miles an hour. My skinny little road tires were not happy with the situation and down I went. Nothing major, just a minor scrape here and there, and the bike held up pretty well: dirty, but no damage. So keep on rolling I did. 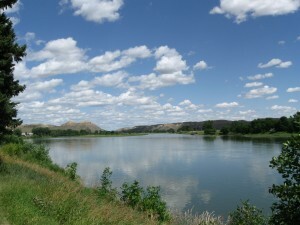 Fort Benton is quite a nice town, and it’s on my list of places I’d like to return to someday (just look at that view of the Missouri River). There are a few companies that run multi-day canoe and camping tours of the river, which sounds like an excellent vacation for some future summer. The Upper Missouri Breaks Interpretive Center was quite fun as well. I happened to stumble into town on the evening of a talk about the geology of the region. Did you know bentonite was named for Fort Benton? You may not even know what bentonite is. It has many uses, but true wine geeks should know it as a commonly used fining agent to remove cloudy proteins from wine. The other really nifty thing about this clay is that when it is wet, it expands to over twice its original volume. This can be very useful or very problematic, depending on the situation. Last, but hardly least, I stopped in at a used bookstore and outdoor equipment store (handy combination). Picked up some new shorts and another book to read. This store was really quite something. Unfortunately, the name of it escapes me at the moment, but Fort Benton isn’t a big town, and I believe it was on 17th St right off from Front Ave. So, if you’re ever in Fort Benton, stop in and say hi to Tom, the owner, and perhaps pick up something fun to read. It was not a long ride from Fort Benton into Great Falls. I arrived early in the afternoon on Tuesday and spent some time cycling along the River’s Edge Trail. The falls that named the town have long been dammed in the interest of hydroelectric power, but there are still some cool river views to be had. From here, I head south, continuing along the Missouri towards the headwaters at Three Forks. Until next time, enjoy some more scenic views of Montana.